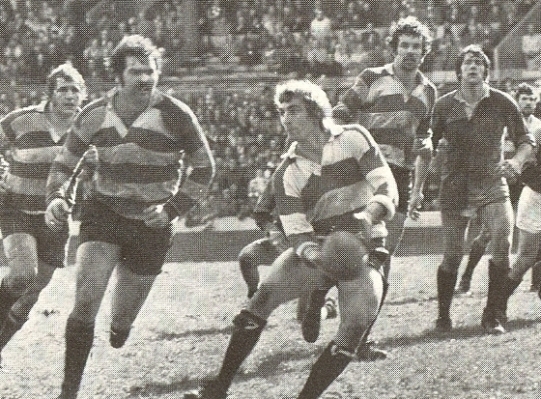 Richard Mogg (“Moggy” to the Kingsholm faithful) was an elusive and strong running wing or centre who played between 1974 and 1992. He is a member of the five man “500 club” having played 510 games for Gloucester, scoring 169 tries. Mogg played for England at Colts, Under 23 and B level, and for Gloucestershire, South and South West and the Barbarians in his long and outstanding career. Richard Roy Mogg was born in Gloucester on 28 February 1956. He was educated at Hatherley School and after leaving school he played a season for Tredworth before joining Gloucester. Richard made his debut for Gloucester against Cheltenham in October 1974 and quickly established himself, while gaining two caps for England Colts. He was selected for an England Under 23 trial at Kingsholm on April 7 1975, five weeks after his 19th birthday. He toured South Africa with Gloucestershire in Summer 1976 and, when he played for Gloucestershire v Japan on September 22, The Times said “Mogg had an outstanding match….his devastating sidestep off the left foot put one in mind of a young Duckham.” He went on to play for England Under 23 against Japan at Twickenham in October and toured Canada with England Under 23 the following summer, playing in both internationals. 1977-78 was a very successful season for Richard Mogg. He played for the South & South West in the new Inter-Divisional Championship and for Gloucestershire in the County Championship. By April 1978, at the age of 22, he had already played more than 160 games for Gloucester and 16 games for Gloucestershire. He was one of the XV who played unchanged throughout Gloucester’s victorious 1978 cup run, scoring the winning try in the John Player Cup Final against Leicester at Twickenham. In the summer he toured Romania with England B. He played for the South and South West against the All Blacks at Bristol in November 1978 but missed out on county selection. With fewer calls from the selectors he appeared in 43 of Gloucester’s 48 games that season. In 1979-80 he was back in favour with the county and played for Gloucestershire in the County Championship Final defeat by Lancashire at Vale of Lune and for the South and South West against the All Blacks at Exeter. In 1980-81 Mogg came closest to England selection in a career of near-misses. He played for England B v Ireland B and for the South and South West in December before appearing in for The Rest in the England trial at Twickenham on 3rd January. The Times commented “Mogg went looking for chances, not without profit” but the Rest were beaten 37-13 by England. He was one of 30 chosen for National Squad training at Bisham Abbey. At the end of that month he played for Gloucestershire in the County Championship Final defeat by Northumberland at Kingsholm. Richard Mogg was again a first choice for Gloucestershire in 1981-82 and played for South and South West against the Wallabies and for England B against France B. He still played over 30 games for Gloucester in perhaps the club’s greatest season, culminating in the John Player Cup Final against Moseley at Twickenham. The elusive England place had now passed him by but he played against the 1983-84 All Blacks and for Gloucestershire in the County Championship Final victory over Somerset at Twickenham in March 1984. His contribution to the game was recognised when he was selected for the Barbarians against Cardiff and Swansea on their 1988 Easter tour, scoring a try in the 21-20 win over Swansea. The Rugby Union Yearbook commented that “the game owes a great deal to the likes of Richard Mogg” and praised his “rousing performances.” on the tour. Moggy continued to be a first choice for Gloucester until the end of 1989-90, a season when he played 37 games for the club scoring 17 tries, and the club so nearly won the league-cup double. At the age of 34 he became the only Gloucester player to play in three cup finals (1978-82-90) in the amateur era, a remarkable testament to his skill, fitness and durability.